This easy to make Mexican Street Corn Dip is my spin on the classic Mexican Street Corn which is made with grilled corn on the cob that’s been slathered with a creamy dressing and spiked with spices and cheese. This dip has the same awesome flavour combinations, it’s just easier to make and serve. 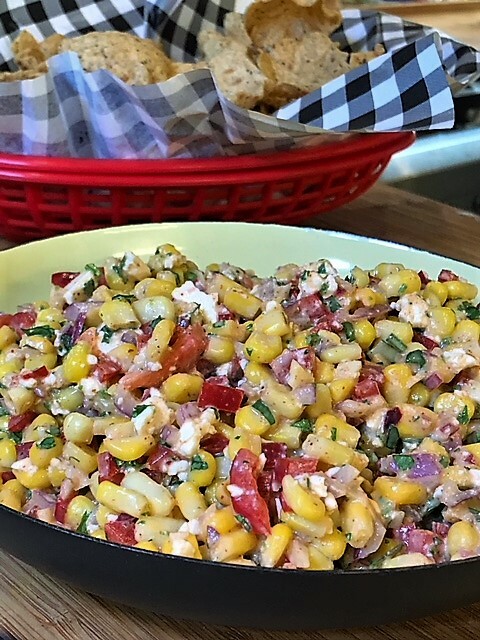 Change up your snacks and dips when you are watching your favourite sporting event and make this Mexican Street Corn Dip. This is perfect for watching Hockey Night in Canada or the Super Bowl. In a large bowl whisk together zest, lime juice, mayo and chili powder. Add garlic, onion, cilantro, red pepper, corn and feta or Cotija. Toss well. Chill until serving time. Can be made up to 2 days in advance. Serve with corn chips or tortilla chips. I use the scoopable tortilla chips. Why do I mince the garlic and then set is aside? Answer: To make sure you’re getting the healthy benefits from garlic, mince it and then let it sit for at least 5-15 minutes. This allows it to oxidize and helps makes the healthy properties more bioavailable to your body. Here’s a video from My Left Frying Pan on how to make the dip, it was LIVE and a bit of a hot mess!